Posted on Fri, Feb 17, 2012 : 1:24 p.m.
A helicopter pilot peers down at the Costco construction site in Pittsfield Township as crews attach an HVAC unit to a cable this morning. Step aside, construction cranes. This looks like a job for a helicopter. People watched from nearby office buildings, drivers stopped their cars and construction crews snapped photos Friday morning as a helicopter hoisted 14 HVAC units — one by one — onto the roof of the new Costco warehouse store under construction in Pittsfield Township. 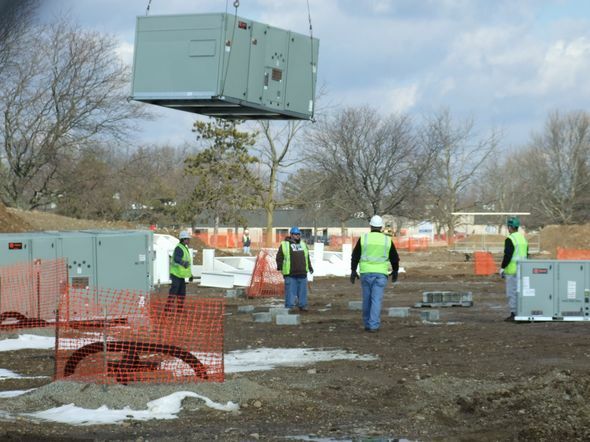 The rare construction maneuver was necessary because of the sheer size of the building, said project manager Luis Alarcon of Robertson Morrison Inc., an Ann Arbor-based heating and cooling company. 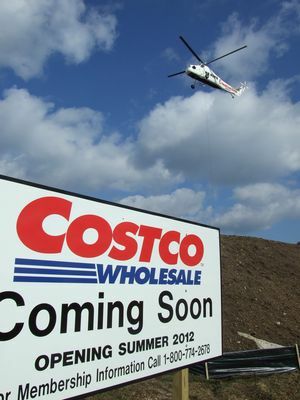 A helicopter hovers over the Costco construction site in Pittsfield Township. Costco is building a 148,000-square-foot store with 720 parking spaces and a gasoline station, located on a 17-acre site in the Airport Plaza industrial park near the corner of State and Ellsworth. The store is officially set to open this summer, and Alarcon said he’s heard construction is ahead of schedule due to favorable weather this winter. Swinging the HVAC units onto the roof, he said, makes the Costco construction crew “one step closer to sealing the exterior of the building.” The contractor for the project is Seattle-based Jackson Dean Construction. 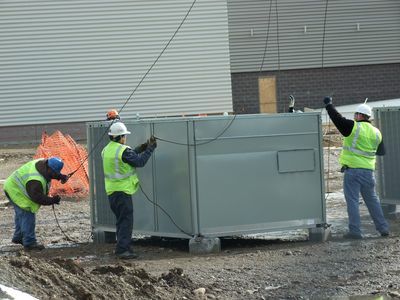 Workers at the Costco site attach an HVAC unit to a cable connected to a helicopter. Months of planning went into the 30-minute helicopter operation, including hiring a construction helicopter company, applying for permits with the Federal Aviation Administration and conducting a safety and coordination meeting. A pilot from Howell-based Construction Helicopters Inc. landed at the Costco site, next to the existing structure, at about 10 a.m. Friday. After a 45-minute safety meeting, five workers stood by the 14 HVAC units on the ground and five workers stood on the Costco roof. 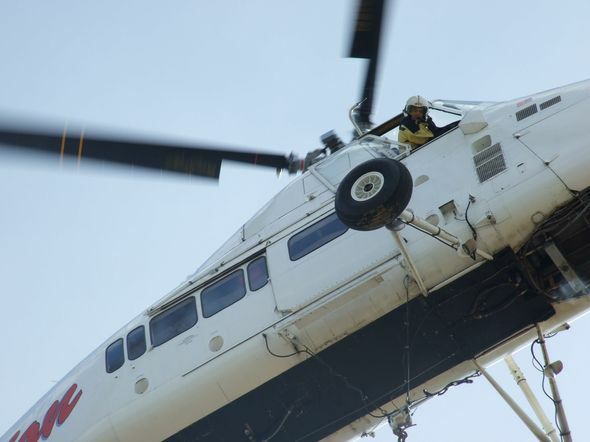 The helicopter took off and hovered over the units as workers used steel hooks tied to a hanging cable to attach the individual HVAC units. The helicopter then flew a short distance to hover over the Costco roof as workers detached the units from the cables. The helicopter took the units over to the roof one by one. A half hour later, the 14 HVAC units were on the roof in a seamless operation. Alarcon - who has been with Robertson Morrison for six years - said this is the first time he has seen the company use a helicopter to place HVAC units, but he said it makes sense for a building this size. “It’s easier than using a crane,” he said. “It’s actually less expensive and a lot quicker time-wise to use a helicopter for this type of building because it’s so large,” he said. Workers at the Costco site watch an HVAC unit hauled away by a helicopter. 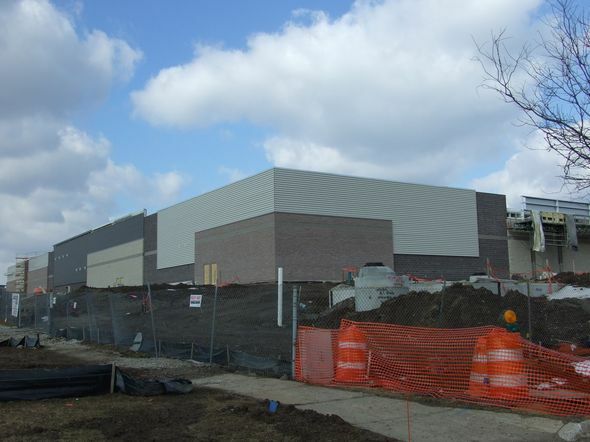 The Costco store in Pittsfield Township is expected to open this summer. Sat, Feb 18, 2012 : 4:21 a.m. Sat, Feb 18, 2012 : 12:37 a.m. I did not realize Costco was so close to completion. I have heard and have seen before these units being lifted onto rather large buildings and especially ones that are too tall for cranes. Petty neat stunt wouldn't you say? Fri, Feb 17, 2012 : 11:08 p.m. In other news, firemen put out fires! Big trucks go vroooom!! Steamshovels, bulldozers dig big holes!! Maybe you would like to do that when you grow up??? It's construction, people. A heavy-lift chopper is not that big a deal. Then again, this is the same pseudo-newspaper that breathlessly reported several dog-bites-man stories last year and provided near-daily updates on a missing cat. How about doing a story on the proposed roundabout at State and Ellsworth instead? That's something people need to know about and is a direct result of this project. Fri, Feb 17, 2012 : 11:01 p.m.
surprised no one is complaining that these employees and shoppers will have Heat/A.C. Fri, Feb 17, 2012 : 10:51 p.m. It is hard to make anything political out of this story. Fri, Feb 17, 2012 : 10:16 p.m. I believe the new HVAC units for Michigan Stadium were also installed using a helicopter. A2.com should also post an informational story to tell the local residents that it is now safe to remove their foil headwear. Fri, Feb 17, 2012 : 10:01 p.m.
Amazing how work acutally gets done without the oversight of the municipal beaurocracy. Hey, maybe Jackson Dean Construction builds bridges too! Sat, Feb 18, 2012 : 7:13 p.m. I doubt this building, like most modern construction, will last as long as bridge. Nothing is driving over it and our society builds ugly, cheap buildings for the short term, not the long term. I do think the bridge has taken too long to construct, I don't think it's a valid comparison. Fri, Feb 17, 2012 : 9:48 p.m.
&quot;The store is officially set to open this summer, and Alarcon said he's heard construction is ahead of schedule due to favorable weather this winter.&quot; Great news! I assume the Stadium Boulevard overpass project is ahead of schedule for the same reason. I am stunned by this progress. I have not driven by the site since they said it was going to start, and they are already putting HVAC on the roof? Fri, Feb 17, 2012 : 8:44 p.m.
That's how they got the equipment on the roof for Briarwood, and I will bet many other large buildings around the area. It's not that unusual. It's the smart way to do it. Sat, Feb 18, 2012 : 1:38 a.m. I know there's a Von Maur store today where a Lord &amp; Taylor was when the south branch of the mall went in, but south is the direction to I-94, the most difficult direction in which to spread. A project using a large crane shouldn't be too near any expressway. Helicopters in use don't close lanes. Sat, Feb 18, 2012 : 1:28 a.m. I wonder if additional HVAC units had to be placed on the south side of Briarwood Mall when it grew in that direction, putting in a Lord &amp; Taylor where no department store had been before because the mall was T-shaped, not cruciform, as it is today. Fri, Feb 17, 2012 : 8:27 p.m. When I worked at the GM Powertrain Plant at Willow Run they used to move ventilation equipment there the same way. We would go outside at break times to watch, it was fascinating. Wish I would have known about this one, may have gone to watch. Sat, Feb 18, 2012 : 1:23 a.m. I watched the video and wondered why nobody's clothes seemed to be affected by the helicopter's rotors shoving so much wind in their direction. And how LOUD the helicopter was! The people on the ground must have taken precautions so that their hats wouldn't be blown off, and worn earplugs. At first I thought a helicopter was used because of Costco's proximity to the Ann Arbor Municipal Airport. So it came from a Howell company instead? I'm inclined to think that the helicopter(s) used at the GM Powertrain Plant at Willow Run were also specialized to move heavy equipment, something that the nearby Willow Run Airport planes were NOT specialized to do. Fri, Feb 17, 2012 : 8:58 p.m.
Glad to know I am not the only person who would have driven to take this sight in! Fri, Feb 17, 2012 : 8:32 p.m.
By the way, pretty cool video too. Thanks. Fri, Feb 17, 2012 : 6:49 p.m. I am not gonna speculate on why they used a helicopter verses a crane, who really cares if you're not paying the bill? One of the thrills of my childhood was when Ford's in Saline was moving in machinery of some sort, my Dad worked as a millwright and loaded us girls up in the old station wagon, so we could go have an upfront look. I must have been 9 or 10 and now at almost 44yrs old, I still have that wonderful memory of the machinery and aircraft! Sat, Feb 18, 2012 : 10:05 p.m.
No, Daytona, I think the point is that since WE'RE not paying the bill, there's no reason for US to speculate. Fri, Feb 17, 2012 : 10:53 p.m.
&quot;who really cares if you are not paying the bill&quot;? I re-read the article and I saw no indication that the bill for the chopper was being picked up by someone other than those responsible for the operation. Do you have information that someone is being soaked for the bill against their wishes? Fri, Feb 17, 2012 : 9:22 p.m.
no need to speculate, says why right in the article. Building is too big for a crane to reach all the areas that the units were to be placed. Fri, Feb 17, 2012 : 6:46 p.m. I won't outright call it a publicity stunt, because maybe it actually is cheaper to get a helicopter than use a crane. But there's no way the project manager's quote that the building is too big for a crane is remotely true. 148,000 square feet is nothing to sneeze at. But we're not talking record-breaking size here - it's just another large department store. And when it comes to the physics of moving large, heavy objects, there's no way a helicopter is more capable than a crane. Fri, Feb 17, 2012 : 9:06 p.m. I have no doubt that those units are spread around the building (to heat evenly) such that any crane employeed would have to be moved multipe times to install all 14 units. Try looking at the placement on the Lowe's on Jackson with Google Earth. Crane booms vary but even using one of the largest would only get you 100 feet or so inside the building face and maybe not that far. So when you factor in the time to transport the crane to site, set up the crane, move the crane over and over and then take the crane away, it would easily make sense to fly them in. Cranes rent for roughly $1,000 per day. I suspect that helicopter rents for roundly $1,000 per hour. Yeah flying would be cheaper. So Clark I think the project manager was saying that the building was too big for a crane to make sense economically. I concur with these responses. I've been on a few of these work crews, and it's helicopter every time. Only difference, in my experience, is that they didn't allow so many people under the lift. Fri, Feb 17, 2012 : 8:48 p.m.
&quot; it's just another large department store.&quot; That's correct. And its not unusual to use helicopters for this purpose on large department stores. The helicopter came from a business that exists primarily for this purpose. This is how the big boys do it, Clark. It's been done many times in the area. You must have missed the others. Fri, Feb 17, 2012 : 7:13 p.m.
How do you propose getting the units to the center of the building? Sorry Clark but you're wrong about everything you said. It's not a stunt. The helicopter is a ton more expensive to lease than a crane (even for 1 hour) and the helicopter is infinitely more capable than a crane. This is also a lot more common than you think. Fri, Feb 17, 2012 : 7:03 p.m.
Can a crane do it in half an hour? Fri, Feb 17, 2012 : 6:43 p.m. They moved and positioned 14 HVAC units in half an hour! That's impressive! I drive by this site every morning and am still amazed by the progress --- favorable weather or not.